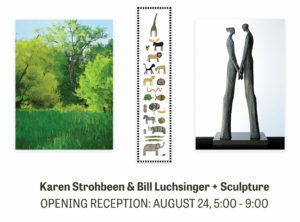 Karen Strohbeen and Bill Luchsinger are two of the Midwest’s most successful living artists. They have been creating delightful stuff for almost 50 years, and plenty of people here have been collecting it for much of that time. They were among the originators of digital printmaking, long before David Hockney made it famous and successful. They still push the limits of that genre and have always incorporated their love of gardening into their art. Probably best known for their PBS TV series the “Perennial Gardener with Karen Strohbeen,” which was produced and directed by Luchsinger, they have used photography and computer processes to create sculpture, photos and prints on paper, canvas and ceramic tile. They have even used them on rugs and dressing room screens. In 1996, they received the Garden Club of America’s Eloise Payne Luquer Medal for special achievement in the field of botany. Their most recent exhibition at Moberg Gallery, through the end of October, features more of their roots art than in recent years. There are no urban landscapes and no Florida subjects this time around, just the gardens and fields of rural Iowa and some of Strohbeen’s much loved animal art. Pieces seem to get bigger each year with these two, and they have a mastery of the digital process now that could trick even young fans and artists into thinking they were looking at paintings. Also impressive in the current show is a sculpture by Dubuque’s Jessica Teckemeyer in which the artist puts a chihuahua in a wolf’s costume, still looking terrified. Also on display is work by University of Northern Iowa professor and sculptor Thomas Stancliffe and his student Dallas Guffy. The latter appears to be the former’s authentic protege. Farhamville artist and former longtime Drake professor Richard Black will be represented at the Anderson Gallery Sept. 7 through Oct. 9. The intaglio and woodprints he makes comment on classical tales of Homer and others in vivid colors and dramatic forms. There will be an opening reception for the octogenarian artist Korean War vet on Sept. 7. Olson Larsen Galleries is hosting “Photo Sensitive” with works of Tim Olson, Christine Carr, Nikolova and Kratzer, John Foxe Sheets, Jim Sincock, Annick Sjobakken, Chris Rayburn, Christopher Reno, David Richmond, Randy Richmond, Alyss Vernon and Molly Wood. This show will play through Sept. 22 and cover black and white, as well as color prints of historical subjects, landscapes, natural disasters and portraiture. Neo Rauch was born in East Germany in 1960 and was orphaned four weeks later. He grew up with grandparents in Leipzig at the height of the Cold War and communist oppression in his native land. Today, he is listed as one of the 1,000 wealthiest people in Germany. Most of the works that made his fortune and reputation seem to exist somewhere around the crossroads of personal history, politics and social oppression. He has most often been compared to Rene Magritte and Gregorio de Chirico, although Rauch does not consider himself a surrealist. Still, his realistic paintings have usually had elements of confusion, like soldiers from different times in history oppressing contemporary folks plus architectural structures that seem incomplete. Rauch is one of the best-known artists from the Leipzig school in Germany. His psychologically complex paintings have been widely collected and written about for more than 20 years.